A cloud-delivered security intelligence platform can help you make sense out of the mountains of data collected from your expanded perimeter of cloud workloads and assets. However, it’s easy to get buried in a data avalanche. 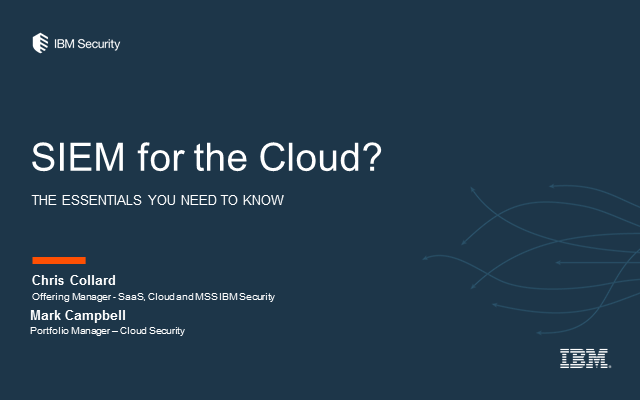 Join us as we discuss the essentials for making sense out of cloud data and keeping your workloads secure using Security Information and Event Management delivered from the cloud. Chris is an information security professional with over 15 years of experience managing information systems and services. He is a Certified Information Systems Security Professional (CISSP) and holds a Certificate of Cloud Security Knowledge (CCSK) from the Cloud Security Alliance. He is Offering Manager for QRadar on Cloud. Mark is the Cloud Security Portfolio Manager for IBM Security. He is a cloud and IT security veteran with more than 15 years of helping clients to adopt security and cloud technologies.